Canine Liver Disease Diet - What To Give To My Dog? Canine Liver Disease Diet – What To Give To My Dog? Your dog’s liver functions much like your own; it carries out the same tasks, carries out these tasks in a similar manner, and has a similar structure. Because of this, we have a wealth of information on identifying and treating liver problems in dogs. Testing to detect elevated liver enzymes in dogs is the most common way to test for liver problems. Once a liver problem has been found, the best form of treatment usually comes in the form of a balanced canine liver disease diet. There are a few dog food brands that make foods designed specifically to treat liver issues. The most popular foods among vets for the treatment of liver disease in dogs are available only by a prescription from your vet. These foods focus on easy to digest proteins, lowered copper intake, and lowered sodium intake. These are all the crucial elements of a proper canine liver disease diet. Copper can accumulate in a damaged liver, so cutting this mineral out as much as possible is very important. Most important of all, though, is making sure your dog receives a controlled amount of easily digested proteins, vegetable proteins are the most common way to relieve strain on the liver. Keeping a close eye on overall food intake is also necessary for maintaining a proper weight for your dog, and avoiding liver cancer in dogs with liver problems. Another major factor in a proper canine liver disease diet is lowered sodium intake. Just as in humans, high sodium intake can cause hypertension in dogs. Portal hypertension is the main sodium problem in dogs with liver problems. This is raised blood pressure in the main vessel (the portal vein) that carries blood from the gastrointestinal tract and spleen into the liver. Asking your vet for these types of food should be your first step in creating a proper liver disease diet for your dog. Also, when buying treats and snacks for your dog, make sure you read the ingredients list and nutrition facts. 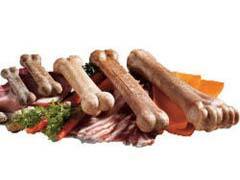 This can help you closely monitor your dog’s diet. Keeping an eye on your pet’s liver functions with frequent testing at the vet is the best way to be sure your canine liver disease diet is working, or what you need to do to make it work.